3-Amelia Frances Walker was born on 20 Mar 1872 in Exton, Tasmania and died on 17 Sep 1968 at age 96. Amelia married Ernest Albert Soden, son of William Soden and Martha Winch, on 1 Dec 1897 in Baptist Manse, Launceston, Tasmania. Ernest was born on 12 Jun 1873 in Westbury, Tasmania and died on 31 Aug 1942 at age 69. 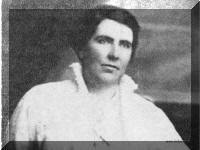 4-Beatrice Louise Soden was born on 23 Jul 1899 in Westbury, Tasmania and died on 16 Aug 1980 at age 81. Beatrice married Alexander Robinson. Alexander was born in New South Wales and died on 28 Oct 1970.